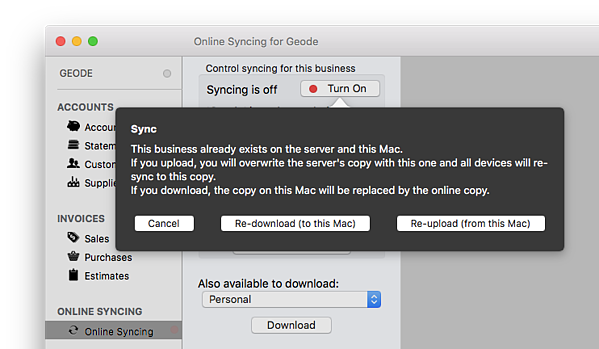 If you have uploaded your business to the sync service in the past, you may have a copy on your device and online. If you do, be careful to understand the implications of each choice. It is likely that one copy has more up to date information in than the other. Making the wrong choice can cause you to re-sync to an older copy of your data. Consider where the latest copy of your data is stored. For example, if you have not been using EasyBooks on your Mac for a long time and have been using it on your iPhone instead, it is likely your iPhone has the latest copy of your data. If the iPhone has been signed in and syncing with the service, the most up to date copy is your online copy. In this case, your Mac has an old copy of your data and you should choose the option to Re-download. The data on your Mac is deleted and replaced with the copy taken from Online Sync. As another example, if you have been signed out of Online Sync on a device, eventually the device will no longer be able to sync from where it left off. This is usually around 90 days since the device last signed in, after which time the system assumes the device is no longer running EasyBooks and stops maintaining state information for it. If you continue to enter new information into this copy of EasyBooks, then turn on Sync, you should choose the option to Re-upload. This deletes the online copy and replaces it with the data from your device. You other devices will re-sync to this copy of the data the next time you open EasyBooks. If two devices have sync turned off, changes made independently on the devices cannot be combined later. Re-syncing your devices always means nominating one of them as the 'current copy'. We recommend leaving sync turned on and starting EasyBooks regularly on each device you want to use it on. This allows each device to sync automatically. If you make the wrong choice and lose your most recent transactions, have a look at "Keeping your data safe". This page explains how EasyBooks makes automatic backups if it thinks you might lose data. In most cases you can recover by following the steps in this article.